Sewing machines give a polished look to craft projects because of their smooth seams. Creating those even seams depends on balanced spool and bobbin thread tension. Unbalanced thread tension makes seams gape open or look puckered. Sometimes, knots or loops appear at the end of stitches. Although uneven or unattractive stitches can be due to other mechanical issues, the most common cause is a bobbin or spool thread that is either too tight or too loose. .
Sewing machines use two threads: an upper (spool) thread and a lower (bobbin) thread. To make proper stitches, the spool thread needs to be threaded correctly through the sewing machine's tension disks, take-up and needle. A dial usually adjusts the tension disks, but disk location varies based on the machine. The bobbin thread is usually adjusted by tightening or loosening the screw on the bobbin case. However, most problems with thread tension can be fixed by adjusting the upper tension disks. When upper thread tension is too tight, the top thread is straight and the bobbin thread loops appear on the right side of the fabric. If, on the other hand, the upper thread tension is loose, the bobbin thread pulls straight across the fabric and the spool thread forms loops on the back of the fabric. When both the upper and lower thread tension settings are too tight, the seam often puckers and stitches start to pop open once the seam is smoothed out. When the two threads are too loose, the seam opens by itself. For routine sewing on most sewing machines, fix thread tension with a basic tension adjustment. First, use the tension disks to adjust spool thread tension. Turn the dial on the tension disks to 4 or 5, then adjust stitch length to 2mm. Using medium speed, sew a seam on two pieces of muslin. Second, adjust the bobbin thread tension after sewing the seam. Tighten the bobbin screw to correct loose tension and loosen it to correct thread tension that is too tight. Find out which thread tension needs to be adjusted by threading the machine with two different colors of thread. For easier identification, use one color for the spool thread and another color for the bobbin thread. 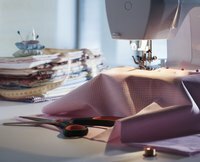 Do a temporary tension adjustment on a sewing machine when switching between fabrics or thread types. In this case, turning the tension dial is usually enough to correct thread tension. If, however, this does not solve the problem, perform a basic tension adjustment. To save time, keep a log of the ideal thread tension settings for specific fabrics and threads for future reference. In some cases, thread tension issues are caused by a loosely wound bobbin or a spool thread that is not threaded correctly through the machine. To avoid this, carefully follow the machine's directions for proper threading and bobbin winding. A dirty sewing machine or one with broken accessories can also cause problems with thread tension. Prevent this by using a soft cloth to periodically remove lint and loose threads from the bobbin case and the tension disks. In addition, discard damaged or bent machine accessories like bobbins, needles and presser feet.